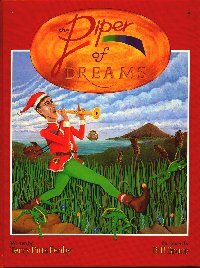 The Piper of Dreams was written by the late Terry Pitts Fenby and illustrated by Bill Bruce. Published on 4 October 1982 by Hodder & Stoughton ISBN 0 340 28606 7, a proportion of the books proceeds was donated to the NSPCC. The prize was a jewelled golden flute buried in the UK. Unfortunately the hunt was solved shortly after publication and so a new prize of a silver flute was offered - to be claimed by postal entries by the closing date in 1983. The original golden flute was buried 100 ft from the monument to Captain Cook at Eastby Moor, North Yorkshire.